Here it is Handmade Monday. And it’s Handmade Monday FORTY! So do go check it out. I made the ghosts from t-shirts and glue that I was going to make for last Monday but went ahead and posted them earlier in the week so people could make them in time for for Halloween. They turned out well, so you might want to check them out for next year (plus, the process will work just as well for other items, is pretty easy and could be fun to do with older children, messy but non-toxic). It’s at Tabletop Ghost. At least see how cute they are! I was going to make pillows out of old sweaters (not wool felted ones, I am allergic to wool so don’t have many old wool sweaters around) but the first one I did is sort of asymmetrical and lumpy and sad looking. I learned a few things in the process, but needless to say, it’s not ready for prime time. Not to worry, I have more old sweaters to work on. We live in South Florida after all, and I have a bunch of old sweaters I’ve finally decided I’m never going to wear. I still love them and I might as well turn them into something I or someone else in my family will use and love. So, that will be an upcoming blog. I know it’s not very original, but so what. It’s been a rather bad week anyway. First, we had 10 inches of rain Friday night alone from the remnants of Hurricane Rina. We have had a few house repair issues that have kept me busy, and I’ve been cleaning out the attic and garage and just doing some general Fall cleaning and trying to get my craft room (which is really a guest bedroom) reorganized to make my crafting life a little easier. I seem to take one step forward and 5 steps backward, as each time I think I’m getting somewhat ahead, something else comes up that requires me to go in another direction. I’m sure there’s a light at the end of the tunnel, but I’m not seeing it. Well, I’m going to be optimistic and say that if you don’t keep moving forward you won’t ever get anywhere. So, onward. I had to have a photo to share, so, I’m sharing this one. This is my first real crewel embroidery project I ever did. It was a footstool for my Mother in Law, the second Christmas we were married (I think), so about 1977. It was an Elsa Williams kit, and I thought I would never finish it, I remember working on it right up until the last minute! It was quite difficult, but interesting because it had a lot of different colors and stitches. My Mother in Law took wonderful care of it, and when she passed away 6 years ago it came back to me, and it makes me think of her, which makes me happy. I don’t know if I will ever do anything like this again, but it’s a little bit inspiring to think I did this! 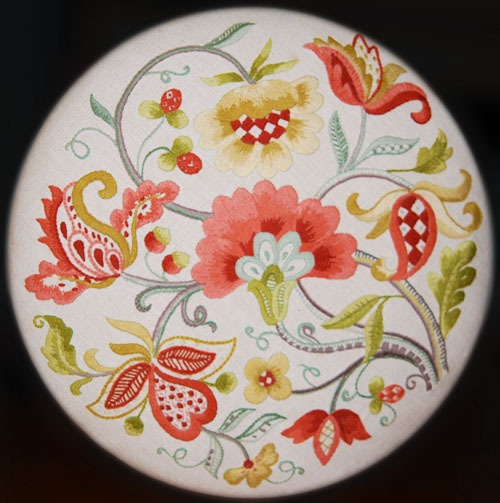 I sure did love this Jacobean pattern. I was going to do this for Monday but I started it Saturday and it didn’t work out and I had to start over. I finally finished the second one today after some mishaps. If I wait until NEXT Monday, obviously it will be too late for Halloween (it nearly is now). But I’m going to go ahead and post this today. If you see this and start today, you can have them made before the weekend, or save this for next year. 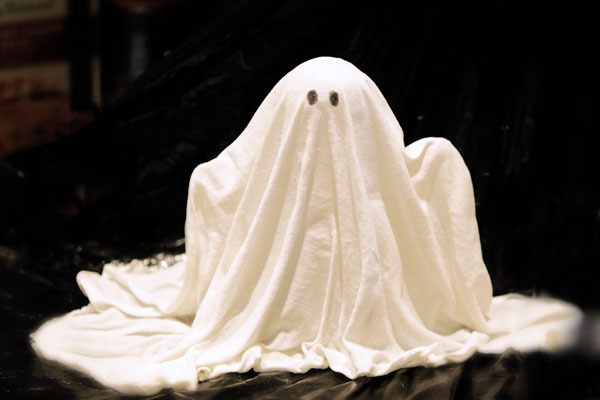 I’m also intrigued by the idea of making things other than ghosts anyway. And you can learn from my mistakes. I certainly did! I don’t know about you, but I remember things better when I do them wrong the first time. I still have a few things on this I want to work out, but this works just fine. And since it costs basically nothing and recycles things you could just get rid of anyway, it’s my favorite sort of craft. The glue is pretty cheap (and who doesn’t have that around the house anyway?). So, it’s a fun thing to try, takes minimal ingredients, makes a mess, and I’ve already made the mistakes! Sounds like a perfect project to me! Click on the link and see how I managed to make a couple of Tabletop Ghosts for Halloween out of old T-Shirts. As always, if you try it, let me know. I would love to see photos. And your comments always make my day! When my youngest son was little he used to ask me to draw him elephants. I’m not sure why. I wasn’t particularly good at it, but I guess he liked elephants (what kid doesn’t?) and I always said yes, and so it was one of our “things”. 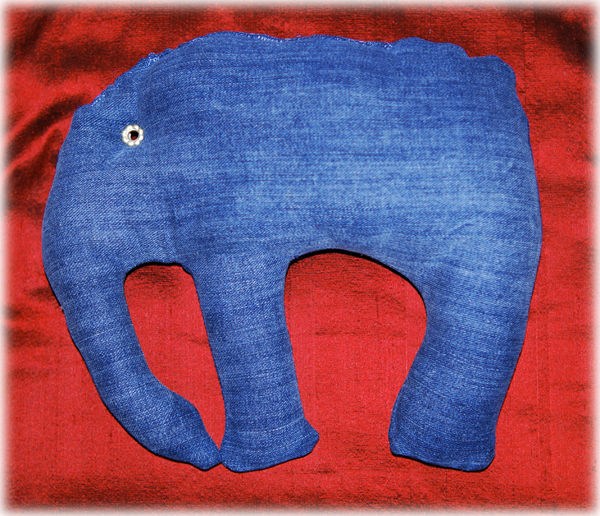 I was trying to think of something to make this weekend with an extra jean’s leg and it occurred to me that a little stuffed elephant would be a fun surprise thing to send him, now that he and his wife are awaiting the birth of their first child. I won’t do a tutorial on it, since it was so simple. I just drew one on computer paper, cut it out (be sure to cut it bigger than the final size to account for seams!) and used that as a pattern. I like to draw on dark fabric (and glass for that matter) with silver sharpie markers. Draw on the wrong side. Cut it out, and then stitch it up except for the back. Use something like a chopstick to turn the legs and trunk right side (don’t make the trunk too thin or you will have a really difficult time turning it!). I actually think they make a tool for this, and I might try to find one and buy it. Stuff it with batting (mostly full), add your eyelet for an eye if you want to (altho I would not consider this baby safe as I think over time that could come off and be a choking hazard, like a button) and hand stitch most of the back up, finish stuffing and hand stitch the rest of it up. 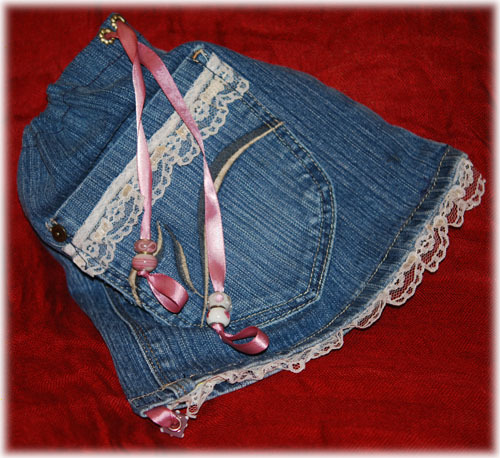 Anyway, please go check out my latest creation Drawstring Jean Purse. BTW, Annie is modeling the purse over there. 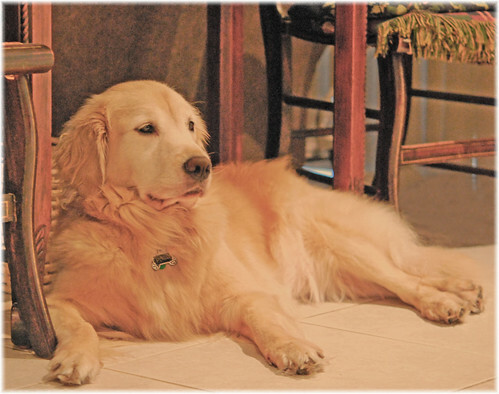 I realized she has been slacking, so expect to see her more often around the blog. Handmade Monday again! And I’m ready. 🙂 Go check it out, but first, check out this fun project. It uses things that you probably already have around; crayons, cooking spray, muffin pans (hopefully you have a heart shaped one, but you can buy the silicone ones online or I think I actually got mine for about $10.00 at Target), cookie sheet, and oh yeah, an oven. If you have kids, let them help by having them bring you all of their broken crayons. Let them get off whatever paper is still on the crayons, break them into smaller pieces and help sort the colors. However adults need to deal with ovens and hot melted crayons. This was so much fun and came out much prettier than I thought. 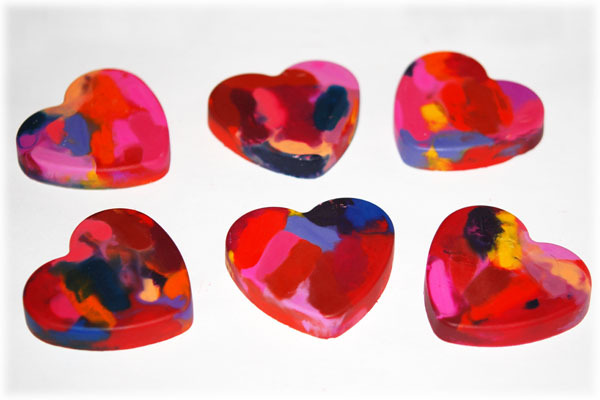 I am envisioning heart shaped crayons for little girls for Valentine’s Day or for party favors. Of course you can do other shapes too. But the hearts were just so awesome! Easy directions, try this out just to recycle those used crayons or to do something fun for your next kid’s party or even if you don’t have kids but want to make a special surprise for one. 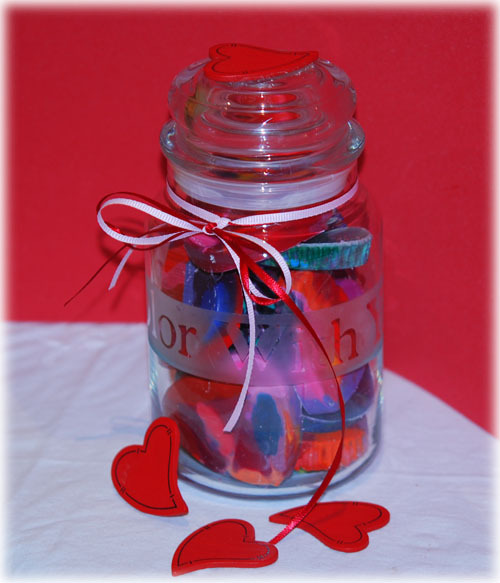 You can find the directions at Crayon Hearts. Check it out! Her Spot 30/52 WooHoo Explored!, a photo by sundero on Flickr. I suppose that is a contradiction of sorts. Or at least it might seem like a bad idea. But it seems to work for me. I don’t follow patterns all that well, and sometimes it’s just more fun to make it up as I go along. Of course that also means that I end up making more work for myself or that things don’t turn out, or that in the end I realize that the project could have been better or easier. Let me back up. I made a purse out of the leg of a pair of jeans I couldn’t wear anymore. I mulled around the idea for awhile, and finally decided to use the leg instead of the top part (which I did years ago when I was a teenager and they were cool in the 1970s). I looked online at various ideas, but didn’t see anything that really struck me so I just decided to go for it and let it lead me where it would. It seemed like the perfect project to help me learn how to use my new machine and remember how to do the few things I already know how to do, sewingwise. I had to buy a few supplies that I don’t keep on hand anymore (or if I do they have managed to hide themselves so well that I finally gave up looking). That took some time as our local craft store has a pretty thin selection of sewing notions, as well as our closest Walmart. They used to have a fabulous fabric section but several years ago they did away with it, and now they carry very little in the way of sewing supplies. Sad. But I was able to scrounge up what I needed and make a sort of a plan (which fell apart as I went along) and got to work. I didn’t take very good photos since my plan was such a non-plan, but I will try to explain what I did. It wasn’t really very complicated. In the end I was pleased enough with the purse to send it on as a gift, so it could have been worse! 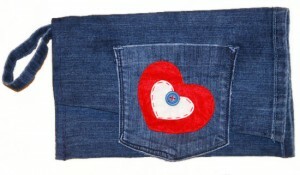 You can find the gory details here at Jeans Purse with Heart.